Nashville, TN (May 13, 2014) ---- Award-winning author and Dove-nominated singer/songwriter, Andrew Peterson, is scheduled to release the fourth and final book in his highly popular Wingfeather Saga series. Published by Rabbit Room Press, The Warden and the Wolf King will release July 22nd and will be available at all retail and online outlets. An advance pre-sale will begin on June 24nd at www.wingfeathersaga.com and www.rabbitroom.com. "There's no way to convey the sense of satisfaction and gratitude I had today when I opened my first box of these books," says Peterson. "The first thing I did when I got home was to line up all four books on a shelf and kind of stand there staring at them for a while. It's a dream come true. I can't say thank you enough to all the people who made it happen." 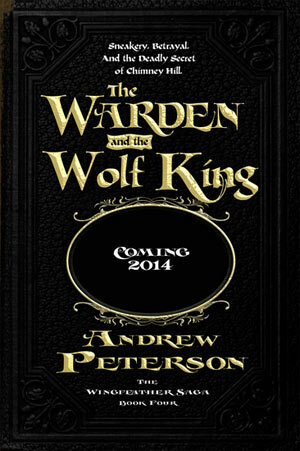 The Warden and the Wolf King received huge support last fall when Peterson launched a Kickstarter campaign with the hopes of raising $14,000 to help with publishing costs of the book. In one month, faithful fans contributed more than $118,000, making The Warden and the Wolf King the most successful fiction campaign in Kickstarter's history. The excess funding will provide fans with an exclusive hardcover edition, more illustrations, a download of an original song from the books, and more. Peterson was surprised and humbled by the strong backing and called it "one of the most gratifying moments of my life." All winter long, people in the Green Hollows have prepared for a final battle with Gnag the Nameless and the Fangs of Dang. Janner, Kalmar, and Leeli-Throne Warden, Wolf King, and Song Maiden of Anniera-are ready and willing to fight alongside the Hollowsfolk, but when the Fangs make the first move and invade Ban Rona, the children are separated. Janner is alone and lost in the hills; Leeli is fighting the Fangs from the rooftops of the city; and Kalmar, who carries a terrible secret, is on a course for the Deeps of Throg. Meanwhile in Skree, Sara Cobbler and Maraly Weaver care for the broken Artham Wingfeather as Fangs muster for battle across the Mighty River Blapp. Sea dragons lurk in the waters. Stranders crawl through the burrows. Ridgerunners and trolls prowl the land. Cloven haunt the forest. Monsters and Fangs and villains lie between the children and their only hope of victory-in the epic conclusion of The Wingfeather Saga. About Andrew Peterson Andrew Peterson is a man of many talents with a successful recording and songwriting career, as well as being an award-winning author and the host of a highly popular online creative community known as the Rabbit Room (www.RabbitRoom.com). Peterson will be releasing a new studio album later this year, while his current record, Light for the Lost Boy, received rave reviews from several media outlets hailing the project "as best album of the year," and garnered two 2013 Dove Award nominations. His previous project Counting Stars debuted at #1 on iTunes, and #6 on Billboard. His single, "Dancing in the Minefields," reached the Top 10 on the Christian AC chart, while the video for the song has received well over 1,000,000 views online. Peterson appeared on the spring and fall legs (2012) of the Steven Curtis Chapman Songs & Stories Tour, and will embark on his fifteenth annual Behold the Lamb of God Christmas Tour in 2014. For more information on Peterson please visit www.Andrew-Peterson.com.